I haven’t posted here in a while, but have been doing some things, though nothing major, but I figured I’ll keep updating. Still not sure what’s up with the Studer. I posted in the Studer mailing list and gotten a couple of responses, but honestly, they went a little over my head. So I’ve been spending time studying electronics, and it’s been going well – I’ve gotten further than I have before. I’m using the ARRL Handbook from 2012 (it was ~$6 total! ), allaboutcircuits.com, and this course I signed up to (it’s free! do it!) but never really completed in the allotted time, but I’m still getting a lot out of it. It’s not clear to me what is the designation of this lamp and base. Some places say T5.5 others and say T2.x. I called Oshino and they said to email them a picture and they’ll help figure out what base it is, but I never heard back. 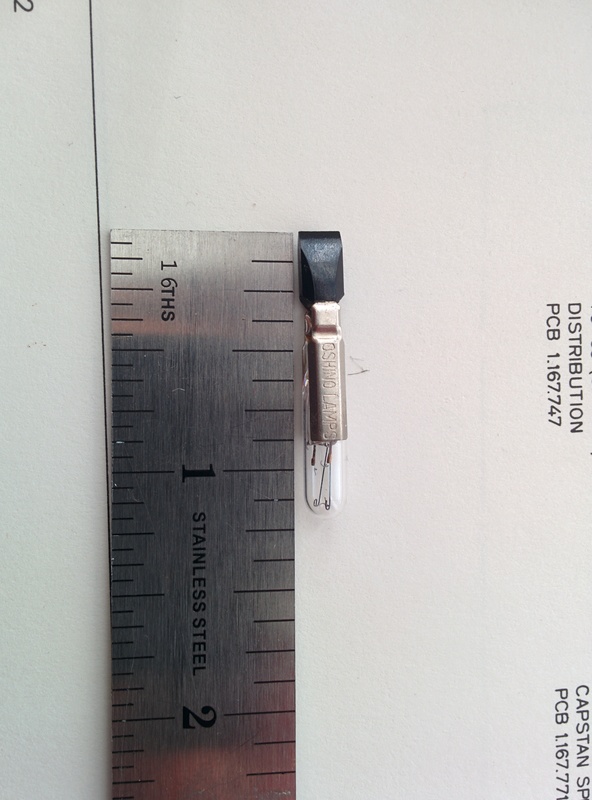 So I go by the dimensions of it which are 30mm in length and 4.7mm diameter. Here are some places online that have these lamps (links to the actual product): Mouser, Topbulb, and Bulbtronics. I spent a lot of time on the phone with the woman from Bubltronics and she said she’ll try and figure out if what I linked to is what I need, but I never heard back from them. Meanwhile, I found someone on eBay that was selling 50 of these for ~$30. He agreed to break up that lot and I bought 20 for $16 shipped or something like that. Much cheaper than it would have been from any of those places I linked. So yeah, keep your eyes open for T5.5 bulbs with the physical dimensions and electrical ratings I mentioned. Other than that I changed strings and setup my Jazzmaster because I’m selling it. I actually have someone who wants to buy it, but I’m getting cold feet. I like that guitar and put so much work into it. And other than that, I have two little projects coming up. A fret level for a friend’s bass, and a rewire of his Jazzmaster. We’re putting a goldfoil in the bridge and rewiring it for separate volume and tone controls and making the rhythm circuit switch into a kill switch.